Commodities carried by the railroad are lumber and forest products, grain and agricultural products, plastics, building materials, propane gas, and solite rock products. 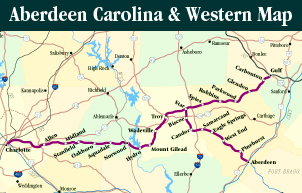 The ACWR runs near the largest stand of hardwoods in the Carolinas, and has access to numerous industrial sites along its lines. Since its inception, the ACWR has upgraded more than 30 miles of its track with 132-pound, continuous-welded rail to handle today’s larger-capacity freight cars. The ACWR has connections with four railroads: CSX, Norfolk Southern, Aberdeen & Rockfish, and Winston-Salem Southbound.